Heat oven to 350°F. Lightly spray cookie sheet with cooking spray. Cut loaf of dough crosswise into 4 pieces to make buns. Place dough pieces seam sides down and 2 inches apart on cookie sheet. With sharp knife, cut 2 diagonal slashes, 1/2 inch deep, on top of each. Place fish sticks on cookie sheet next to dough. Bake 21 to 24 minutes or until buns are golden brown. Cool 2 minutes. With serrated knife, cut buns in half horizontally. Spread bottom half of each bun with 1 tablespoon tartar sauce. 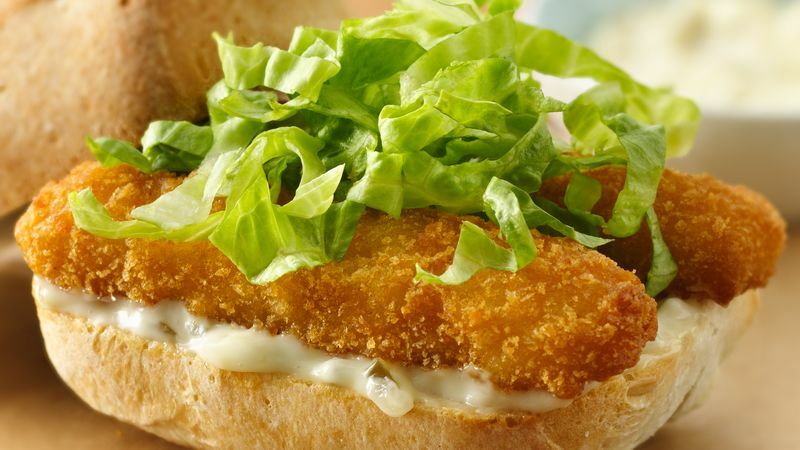 Top each with 2 fish sticks and 1/4 cup lettuce. Cover each with top half of bun. Fish patties can be used instead of the fish sticks. However, they may need to bake longer. Another time, top the fish sticks with deli coleslaw instead of the shredded lettuce and omit the tartar sauce.